The easy, comfortable, and safe method to rid small noses of excess mucus so that your baby can breathe, eat and sleep better! Baby NäsaKleen can be safely used on newborns, infants, toddlers and small children. 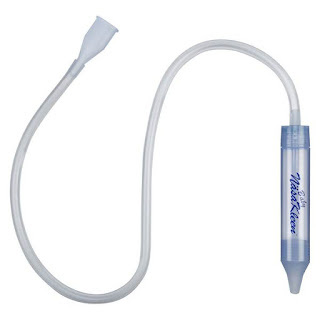 Baby NäsaKleen is a nasal aspirator used to gently remove excess mucus from babies' noses. Baby NäsaKleen is particularly recommended prior to feeding your baby or before sleeping. 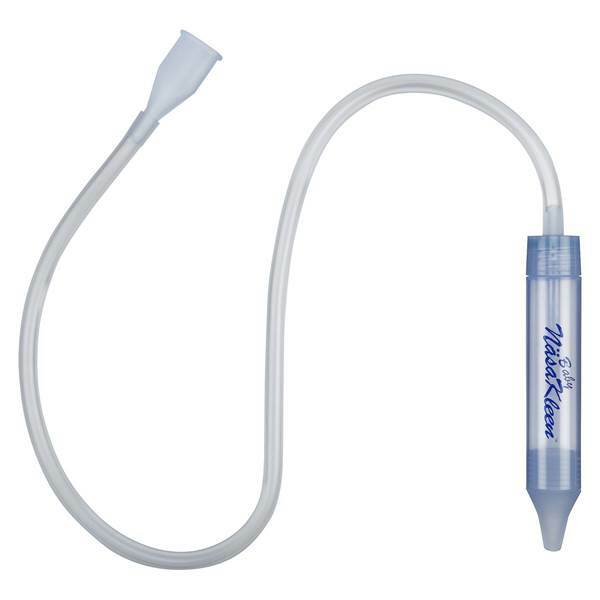 Baby NäsaKleen consists of a silicone nozzle, a plastic chamber with a hygiene filter, a tube and mouthpiece. The mucous is aspirated by placing the nozzle slightly inside the baby's nose and gently applying suction through the mouthpiece. Unlike traditional baby bulb syringes or electrical aspirators, Baby NäsaKleen gives the parent continuous and complete control of the suction process for maximum safety, comfort and effectiveness. Baby NäsaKleen can safely be used on newborns, infants, and small children. The nozzle is made of latex-free medical-grade silicone - the safest and most comfortable material for use on babies’ little noses! All parts of Baby NäsaKleen are DEHP/phthalate, BPA and latex-free. Before using Baby NäsaKleen on your child, test the suction on your hand/finger to familiarize yourself with the unit and the strength of the suction. 1. Always wash your hands before and after using the Baby NäsaKleen product. 2. Insert a hygiene filter into the two part chamber unit - tighten both parts securely. (The unit does not come assembled with a filter already placed inside)! 3. Find a comfortable setting - there are several ways to position your baby. One suggestion is to lay her in your lap, face up with her head gently secured between your knees - baby's feet on either side of your waist. Let her head drop backward slightly. Another way is to simply lay her in a bed or crib - with you standing next to her. 4. 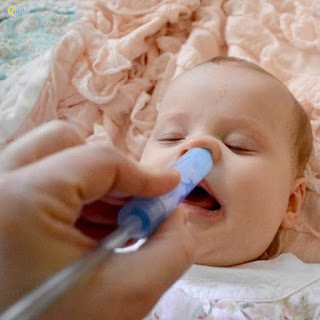 Place the nozzle slightly inside the baby’s nostril and gently apply suction with your mouth through the mouthpiece. For best result, point the nozzle straight back (towards neck) and not upward (towards eyes)! The mucus will collect in the transparent chamber. The chamber contains a hygiene filter to prevent any mucus from leaving the chamber or any bacteria infecting the parent. Repeat the process with the other nostril if needed. 5. If the mucus is particularly dry or sticky we recommend that you apply saline solution into the nostrils before aspirating. 6. Clean unit and discard filter. Do not use Baby NäsaKleen more than 3-4 times per day unless directed by your physician. Keep in mind that aspirating your baby’s nose should be a gentle process – and when done correctly, it actually feels good for the baby. The entire process should take less than 60 seconds. If your baby resists vigorously, stop the process and try again later. Baby NäsaKleen should only be used on babies by an adult/parent. Disassemble and wash all parts with soap and warm water. The foam filter should be changed after every use. Store in a dry environment at room temperature. Be sure to allow all parts to dry completely when not in use. Is Baby NäsaKleen made of safe materials? Yes - All parts of Baby NäsaKleen are BPA, DEHP/phthalate, and latex-free. Is Baby NäsaKleen safe to use on newborns? Yes – Baby NäsaKleen is safe to use on newborns, infants and small children. My baby is very stuffy, but nothing comes out when I aspirate her. Try applying a few drops of saline in each nostril - wait for a few moments and then aspirate again. Caution: Do not use saline drops for more than four consecutive days as it may dry out the mucous membranes. Is it possible for me to contract my baby's cold when using Baby NäsaKleen? No - The hygiene filter prevents mucus and bacteria transfer from child to user. 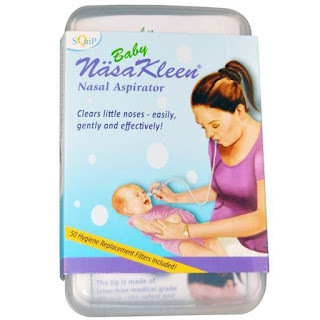 How is Baby NäsaKleen different than nasal bulb syringes or electrical aspirators? The traditional bulb syringes are very hard to clean, which makes them susceptible to spread infection. Electrical aspirators typically have one suction mode, which makes it harder to control the suction – particularly when the level of suction required differs between babies. How do I clean Baby NäsaKleen? All parts should be disassembled and washed with soap and warm water – let air dry. The hygiene filter should be changed after each use. Can you use the nasal aspirator more than once? Yes, Baby NäsaKleen is designed for multiple use. WARNING: We recommend that you consult your baby's physician before using this product. If your baby has any known nasal ailments, we recommend that you consult your baby's physician before using this product.